Children and adults with cerebral palsy do not all suffer from the exact same movement disorders. Cerebral palsy is not a solitary condition. CP is actually an umbrella term that includes a cluster of related muscle movement disorders caused by damage to the area of the brain that controls movement. All the specific movement disorders classified as "cerebral palsy" are initially caused by injury to the brain during its earliest developmental stages (i.e., pregnancy and childbirth). Neurologic injury to the brain during this stage has permanent consequences. It essentially creates a neurologic defect that disrupts the ability of the person's brain to properly control and direct the basic movement of muscles in specific areas. Aside from this common point of origin, however, each individual case of cerebral palsy can exhibit a highly diverse array of clinical symptoms and level of severity. Cerebral palsy is generally classified into 4 accepted sub-types: (1) ataxic; (2) dyskinetic; (3) spastic; and (4) mixed. 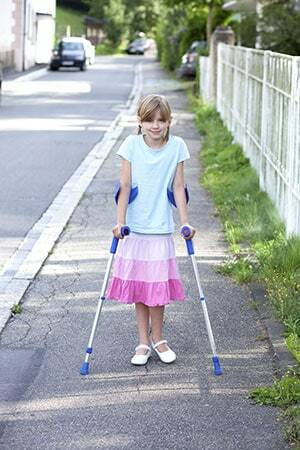 This page will examine the nature and characteristics of spastic cerebral palsy. For more general information about the 4 sub-types visit our page on Classifications of Cerebral Palsy. Spastic cerebral palsy (sometimes described clinically as "spasticity") is by far the most common of the cerebral palsy subtypes. According to some research estimates, spastic CP accounts for as many as 77% of all diagnosed cases of cerebral palsy. The distinct clinical symptom that defines spastic CP is hypertonia. Hypertonia is extreme and involuntary stiffness and rigidity of opposing muscles. Individuals with spastic cerebral palsy are afflicted with disabling hypertonia in particular parts of their body. The opposing muscle sets in the area of the body affected by hypertonia are extremely tight and tend to freeze up and become rigid when attempting to move. For example, if a child with spastic CP attempts to move their legs to walk their legs will basically lock up as the muscles become rigid and oppose each other. This disabling spasticity in the muscles is the result of scrambled, abnormal control signals from the individual's brain. The human brain is supposed to direct, coordinate and control every single movement of the body. Everything we do with our body, from writing or raising an arm to more complex movements such as running or walking, is operated and controlled by our brain through impulse signals delivered over a complex network of nerve channels. To execute just about any movement of the body requires cooperative coordination between the muscles involved. For example, if you want to bed your arm up at the elbow the bicep muscles need to engage (to pull the lower arm up) while your triceps need to relax or disengage (to allow the arm up). The brain is tasked with coordinating the movements of opposing muscles. The movement signal from the brain directs certain muscles to engage while the opposing muscles relax. When someone has spastic CP their brain is not able to send these normal movement signals to certain muscles. Rather than signaling one set of muscles to relax while opposing muscles engage, the spastic CP brain sends a distorted signal that directs both opposing muscle sets to engage at the same time. This causes the opposing muscles to lock up and become rigid. The dysfunction of the brain in a person with spastic CP can be compared to a broken traffic light at a busy intersection. Normally the traffic light allows traffic to proceed in one direction with a green light while stopping traffic in the opposite direction with a red light. If the traffic signal gave green lights to both directions at the same time it would result in gridlock. When an individual has spastic CP, their brain is similar to a traffic light that gives green signals to opposing muscles at the same time. Instead of a coordinated movement, the opposing muscles lock like gridlocked traffic. The result is very stiff, difficult and rigid body movements. One unique characteristic of spastic cerebral palsy is that it tends to afflict only specific areas or parts of the body. This has led to the development of further sub classifications of spastic cerebral palsy cases based on the involved areas of the body. There are 3 different sub classifications differentiated by the area of the body that suffers from hypertonia. Spastic Diplegia: spastic CP cases are subtyped as spastic diplegia (or "diplegic spastic CP") when the individual only suffers from muscle spasticity in the legs or lower body. Spastic diplegia is the 2nd most common subtype of spastic CP accounting for about 20% of all diagnosed cases. Spastic diplegia normally only have problems moving the muscles in their legs while the arms and upper body remain unaffected by hypertonia. This is also the least severe subtype of spastic CP because the muscle spasticity confined to the lower body tends to be less severe than other forms. Children with diplegic spastic CP frequently need to use orthotics or mobility crutches with elbow supports. The hypertonia in their lower body tends to force the knees together giving them a characteristic gait sometimes described "scissor" legs. Spastic Hemiplegia: this subtype of spastic CP occurs when muscle spasticity is limited to only one specific side of the body (left or right). The non-afflicted side of the body enjoys normal movement. For obvious reasons spastic hemiplegia is often called "one-sided" cerebral palsy. Spastic hemiplegia is the most common subtype of spastic CP. As many as 30% of all cerebral palsy cases are defined as spastic hemiplegia. Hypertonia on the afflicted side of the body with spastic hemiplegia tends to be more severe in the arms and upper body. Spastic Quadriplegia: spastic quadriplegia is the most severe and debilitating subtype of spastic CP. It occurs when the entire body (bother upper and lower / left and right) is afflicted by disabling hypertonia. Spastic quadriplegia almost always leaves the individual permanently confined to a wheelchair and with limited functionality.